The site Counted as Cast is a good resource for information about what systems are out there, where they are used, and what sort of issues there are with EVTs. What is interesting to me is that the primary arguments for EVTs (accessibility and cost saving) are fairly weak. It’s easier to rig an electronic voting machine than a Las Vegas slot machine, says University of Pennsylvania visiting professor Steve Freeman. That’s because Vegas slots are better monitored and regulated than America’s voting machines, Freeman writes in a book out in July that argues, among other things, that President Bush may owe his 2004 win to an unfair vote count. We’ll wait to read his book before making a judgment about that. But Freeman has assembled comparisons that suggest Americans protect their vices more than they guard their rights, according to data he presented at an October meeting of the American Statistical Association in Philadelphia. Did Sequoia intentionally sabotage the 2000 elections? Burried in my summary of the broadcast of Dan Rather presents “The Trouble with Touch Screens” is a description of allegations of incompetence and/or fraud by Sequoia voting systems in their production of punchcard ballots for the 2000 election. These are the punchcards that were used in Florida and taught Americans terms like hanging chad. Did Sequoia voting systems knowingly produce defective ballots? Did Sequoia voting systems intentionally produce defective ballots? Did Sequoia voting systems intentionally produce especially defective ballots for Palm Beach county? Did Sequoia voting systems attempt to cover-up the evidence of these problems? Are you unhappy with the incompetence, poor quality, and allegations of fraud that are revealed in Dan Rather’s “The Trouble with Touch Screens”? Go sign the petition demanding that Congress investigate the allegations made in the report. BlogPulse’s trend search tool is another service to track the popularity of search terms over time based on how many blogs mentioned them recently. Type your search terms in the boxes on the left. Type descriptive labels for each search into the boxes on the right. Then choose your time frame: 1, 2, 3 or 6 months. They only allow three terms to be searched and graphed at a time. 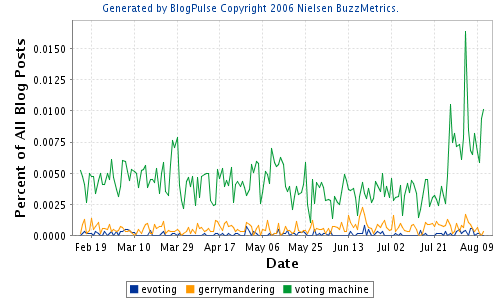 Here is an example search of “evoting” vs “voting machine” vs “gerrymandering”. Of note in this sample is that the choice of keywords is very important. “voting machine” and “evoting” may be synonyms but they get very different results. From my experimentation, it appears that they do NOT support advanced query syntax like boolean expressions in their trend tool. clearly state whether users are allowed to save trend graph images and host those images on their own sites. You can now Subscribe to All About Voting via email! Not everyone is comfortable using the web interface or using RSS so this gives people another option for following my rantings this blog. I also surface subscription options up in the side bar.